Pinkadots Elementary : Taking a stance: Opinion writing for a debate! Taking a stance: Opinion writing for a debate! Wohoo! It's finally Friday! We had a full week this week since our President's Day break was taken back due to Hurricane Sandy in the beginning of the year and our classes continued studying "Revolutionaries of the Past". I am spending my Friday night getting plans ready for next week's big debate! In honor of this, I thought I'd write out some teacher tips for anyone considering holding a debate in their class. I actually have a principal observation next week and will be holding a class debate. 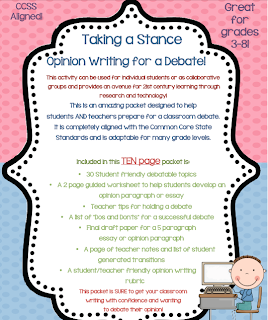 I created an awesome packet about opinion writing for a debate (complete with 30 student friendly debate topics, teacher and student tips, & step guided instructions for students) and am so excited to use it for the observation. Prepping For a Debate: Teacher tips to help! #1 Debate? Why debate? Debates are great for so many reasons. Besides being completely aligned to the CCSS, debates cover a ton of skills. The students have the opportunity to research a topic, take notes, and understand the information enough to take a stance. They then have to use the evidence from their research to back up their opinion. When they are comfortable with this they have to be accountable for their research and stance and verbally address the situation with peers. Getting students to use grade appropriate academic language collaborate in discussion, and talk passionately about a debatable topic is awesome and so rewarding as a teacher. These are skills that will be useful to them for the rest of their lives. #2 Establish rules- Be sure to be consistent with the rules. What you do for one side has to be the same for the other side. For example, you could have one side present their debate. Then let the other side present their debate. Then finish with some rebuttals. You could also have one person on one side present a point, and then let one person on the other side present a point. Then go back and forth between the teams. I find that having students write their key points on an index card before the debate allows for 100% participation, even if students end up piggybacking off a similar idea. #3 Use a timer! One thing you'll want to make sure you have set is a time limit. That could mean each team gets a certain amount of time to present their points before it's the other team's turn or it could mean the whole debate is going to last a certain amount of time. When that time is up, the debate is over no matter how much more people have to say. #4 Conversation: You may also have to establish rules about people not interrupting each other and about how you decide who is the next person to talk, whether each person on the team gets a chance or the person who raises their hand gets the next opportunity. Be sure to have the students write down the facts they wish to discuss on an index card and talk with their “group” before the debate. Some students may wish to “piggyback” off of each other’s ideas to get their points across. #5 Topics: Allow students to pick topics- Yes, you'll have to establish boundaries on this one, and the boundaries might depend upon the students' age and interests. Check out the thirty ideas in the previous page to get your class started. If the students are interested in the topic, they are more likely to participate in the debate. If it's something none of them (or few of them) care about, you're probably not going to get much class participation. #6 Have fun! Let the students talk! If it doesn’t work perfectly the first time, don’t give up! Try again! Taking a Stance/ Opinion Writing for a Debate! If this sounds like something you'd like to try definitely check out my packet on TPT! You won't be disappointed! Enjoy your weekend, teacher friends!